A smashed pot uncovered at the site of an 1800s longhouse could be evidence of a potentially violent eviction, archaeologists have suggested. Hundreds of the homes were abandoned during the Highland Clearances, when families were moved off land to make way for large-scale sheep production. Thatched roofs of longhouses were set on fire and walls toppled to prevent people from moving back into them. The pot at Lower Caen in Sutherland was found under a collapsed wall. Archaeologists have been excavating the site as part of a wider Timespan Museum-led project exploring the Clearances. Site director Dr Keir Strickland, of Orkney College UHI, said pieces of broken pottery were found directly under the wall. He said: "It really suggests the pot was dropped, smashed in place and there was no time to pick up the pieces and the wall has then come down almost immediately, or certainly within days." Dr Strickland added: "There is a sense of, if not violence, then a very forceful eviction and demolition of buildings to prevent people coming back to this place." Academics from various universities, including Durham, St Andrews, Edinburgh, Aberdeen and the University of the Highlands and Islands, are involved in the excavation. A feature of the Clearances in Sutherland was the displacement of about 100 people from the Strath of Kildonan in 1813. Several of the families sailed to Hudson Bay, in north east Canada, where they were forced to build their own shelters to protect themselves against severe winter conditions. The following spring, they set off on foot for the Red River Settlement around Lake Winnipeg in Canada, where Scottish aristocrat, the Earl of Selkirk, had promised them land. Many made the 100 mile (161km) journey in handmade snowshoes. 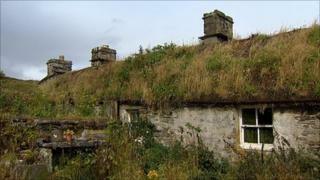 Surviving examples of thatched longhouses include The Corr at Latheron, near Wick in Caithness.